From the incredible life of superstar Donny Osmond, comes the exclusive, show-stopping designs of the Donny Osmond Home Collection. Firm believers in making home and family their number one priority, Donny and Debbie Osmond were inspired to create a comfortable, stylish and versatile home décor collection designed to help everyone create warm, loving and lasting memories. A brand with heart, Donny & Debbie's collection is packed floor to ceiling with gorgeous furniture, wall art, mirrors, accent pieces, area rugs, bedding and so much more to help make your spaces a joy to come home to. 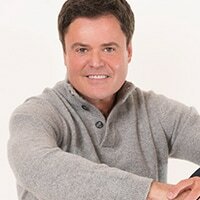 Donny Osmond is more than a memory for his millions of fans, he's an aspirational icon of family life, hard work and happiness at home. Time-honored values of quality and style uphold the same attributes and virtues that have made Donny one of the most beloved entertainers in the world. His influence spans decades, crosses generations and invokes heartfelt memories for millions of fans. From Donny's show business career and radio show success to his fulfilled life creating a loving home, Donny embodies a quality of life he hopes everyone will be inspired to achieve.